There are many wonderful restaurants in the greater Phoenix area. Steakhouses, seafood, ethnic foods, Southwestern cuisine, Native American fare—you name it, and Phoenix probably has it. What Phoenix doesn't have is a coastline. That is certainly limiting for people who might crave an ocean view while they dine. Add to that the fact that there are very few skyscrapers (or none, depending on your definition), so there aren't many dining spots on the 70th floor. As a matter of fact, there aren't any 70th floors in Arizona! If you are searching for a dining experience with a scenic view, you aren't totally out of luck. Whether it is a romantic evening out, a special occasion, a wedding dinner, or just a desire to feel that atmosphere of something bigger and greater than the dining room, you have several worthy options in the Phoenix and Scottsdale areas. Many of these restaurants are considered upscale, and there may be a dress code. Most restaurants with a view are in either Phoenix or Scottsdale, but there are a few others featured here as well. Nestled high on a mountain ridge above Scottsdale and Fountain Hills, offering 360˚ views of the Sonoran Desert and mountain vista with floor-to-ceiling glass panels and outdoor seating. The Chef uses fresh and local ingredients to create new, healthful and fun selections. Flourish pairs each meal with sweeping vistas of Scottsdale, Fountain Hills, and the distant Four Peaks wilderness. Longtime Phoenix residents are sure to still call Compass Arizona Grill by its former name, The Compass Room. It opened in 1976 and is the only revolving restaurant in Arizona. Your 360° view of the Valley of the Sun takes less than an hour, and, weather permitting, you'll be able to see the entire downtown area and beyond from the 24th floor of the Hyatt Regency Phoenix. This award-winning restaurant features Contemporary American cuisine with Southwest flair. It is within walking distance of the Phoenix Convention Center, Symphony Hall, Herberger Theatre, Comerica Theatre, and other downtown Phoenix entertainment venues. You can get there using Valley Metro Rail, closest to the 3rd Street & Washington Street / 3rd Street & Jefferson Street stations. Those are split stations. Compass Arizona Grill shed the dark decor of the 90s with a bright, modern transformation. The menu also received a makeover. There aren't many selections, but seasonal menus include creative and beautifully presented dishes. It is an obvious choice for a special occasion dining experience. Be prepared for crowds when there are big downtown events. If you want to enjoy the sunset from your table, make your reservations for at least 30 minutes before you expect the sun to go down to get the full show and to have your first glass of wine from the award-winning wine list already in hand! The premium tables are the ones nearest the windows. You will, however, feel the motion there more than at the outside row of tables, where you can still enjoy the view. One full rotation of the restaurant takes less than an hour, so for a nice, multicourse meal you'll enjoy the full view at least twice; this is not a place to dine in a rush. If two of you are seated by the window, you might want to position yourselves side-by-side, both facing the direction of the forward rotation. Different Pointe of View is a distinct and unforgettable dining destination that over its 25-year history has evolved into a culinary experience just as memorable as its stunning views atop North Mountain in Phoenix. Guests of this renowned, mountaintop restaurant are treated to an innovative and bold menu in a fine dining experience poised 1,800 feet above the Valley of the Sun. Floor-to-ceiling windows showcase the dramatic panoramas of the Valley’s desert landscape, the city's twinkling lights, and Arizona's breathtaking sunsets. The Terrace Room patio feels like an outdoor living room with one-of-a-kind city views. An eight-foot-tall, hand-forged iron arbor frames a cliff-edge fountain creating an ideal photo opportunity for weddings and celebrations. A nine-foot outdoor fire pit adds magic to an evening under the stars. If you are considering a special adventure in dining at one of the most romantic restaurants in Phoenix, you might want to try a Winemaker Dinner at Different Pointe of View. Wonderful! elements restaurant is the heart of the Sanctuary on Camelback Mountain food and beverage operation, offering farm-fresh American cuisine with Asian accents that is simple and elegant. Fresh, local ingredients are procured from a network of artisans and organic farmers for menus that change monthly to reflect seasonal harvests. Food presentation at elements is as compelling as the ruggedly beautiful landscape that surrounds diners through floor-to-ceiling windows on three sides of the restaurant. Enjoy dining at Geordie’s Restaurant and Lounge within The Wrigley Mansion. Geordie’s offers a dining experience that is anything but ordinary. With breathtaking views of the city and a choice of casual or upscale dining, you are guaranteed to have a memorable experience. Geordie's describes their dinner cuisine as a fresh, new, artful American menu. Geordie's Lounge also has dramatic views. Located in Fountain Hills, on the slope of Eagle Mountain, The Grille @ Eagle Mountain offers a panoramic view of Scottsdale and the East Valley. The Grille is associated with the Eagle Mountain Golf Club. The Grille is open daily for breakfast, lunch and late afternoon appetizers, and there's an all-you-can-eat buffet every Wednesday from 4:30 p.m. to 7:30 p.m. Check online for occasional Gourmet Wine Dinners and Dinner & a Movie nights. Of course, they can arrange weddings and other special evening events. You'll find J&G Steakhouse on the penthouse level of the award-winning​ Phoenician in Scottsdale, Arizona. Floor to ceiling windows showcases sprawling desert vistas in the main room, while two offset private dining areas provide a more intimate experience. Outside, two oval banquettes surrounded by blazing fire pits dot the terrace. As for the food, premium meats and a global selection of fresh fish are the backbone of the menu, including the highest quality raw items from the east and west coasts. 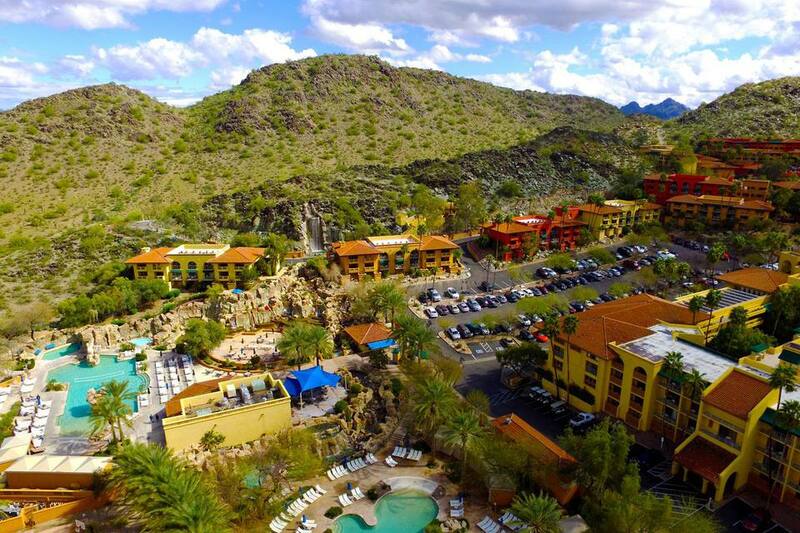 Enjoy sweeping views of Sierra Estrella and South Mountain ranges while you take in a majestic Arizona Sunset at Kai, located in the Sheraton Grand at Wild Horse Pass. Kai, the Pima word for “seed,” has great relevance to the people of the Gila River Indian Community: a connection to their past, their reverence for all of nature, and the belief that the land provides them with everything they need. Located on the Gila River Indian Reservation, Kai has become one of Arizona’s most celebrated dining experiences. Kai offers a contemporary approach to Native American cuisine and is the only AAA Five-Diamond/Forbes Five-Star dining experience in Arizona. This is the first time for any Native American owned restaurant to receive this exclusive combination of awards. The essence of the Pima and Maricopa tribes are incorporated into the menu and restaurant décor. Piñon Grill features Sonoran contemporary cuisine in a relaxing and intimate atmosphere surrounded by Camelback Lake, golf course vistas, and the McDowell Mountains. The lakeside terrace offers enchanting views and reflections of spectacular sunsets. Check the restaurant's calendar for special events and happy hour deals. Beautiful sunsets happen during happy hour! Enjoy panoramic city and desert views from Talavera, located in the Four Seasons Scottsdale. Talavera features contemporary American cuisine with an emphasis on prime cuts of meat, poultry, and game from boutique purveyors, as well as fresh seafood and other specialty dishes. The central focal point of Talavera is a dramatic fire element framed by glass positioned for both indoor and outdoor diners to enjoy. Ceiling to floor windows offers a spectacular valley view while you dine in this upscale restaurant with a menu often referred to as New American Cuisine. Beef is the highlight here, although a few other seafood and other entrees are offered. Located in the Phoenix Marriott Resort Tempe at The Buttes, Top of the Rock is open only for dinner. Orange Sky is an ​award-winning restaurant featuring steaks and seafood utilizing locally sourced ingredients where possible. Located on the 15th floor of the Talking Stick Resort, Orange Sky is enclosed in floor to ceiling glass windows affording sunset, mountain and golf course views from the lounges as well as the dining room. Check the dress code and make a reservation.